Excerpt: A general summary of what is contained in the previous part of the work. A transition to the doctrine of prayer. Its connection with the subject of faith. // 2. Prayer defined. Its necessity and use. // 3. Objection, that prayer seems useless, because God already knows our wants. Answer, from the institution and end of prayer. Confirmation by example. Its necessity and propriety. Perpetually reminds us of our duty, and leads to meditation on divine providence. Conclusion. Prayer a most useful exercise. This proved by three passages of Scripture. // 4. Rules to be observed in prayer. First, reverence to God. How the mind ought to be composed. // 5. All giddiness of mind must be excluded, and all our feelings seriously engaged. This confirmed by the form of lifting the hand in prayer. We must ask only in so far as God permits. To help our weakness, God gives the Spirit to be our guide in prayer. What the office of the Spirit in this respect. We must still pray both with the heart and the lips. // 6. Second rule of prayer, a sense of our want. This rule violated, 1. By perfunctory and formal prayer 2. By hypocrites who have no sense of their sins. 3. By giddiness in prayer. Remedies. // 7. Objection, that we are not always under the same necessity of praying. Answer, we must pray always. This answer confirmed by an examination of the dangers by which both our life and our salvation are every moment threatened. Confirmed farther by the command and permission of God, by the nature of true repentance, and a consideration of impenitence. Conclusion. // 8. Third rule, the suppression of all pride. Examples. Daniel, David, Isaiah, Jeremiah, Baruch. // 9. Advantage of thus suppressing pride. It leads to earnest entreaty for pardon, accompanied with humble confession and sure confidence in the Divine mercy. This may not always be expressed in words. It is peculiar to pious penitents. 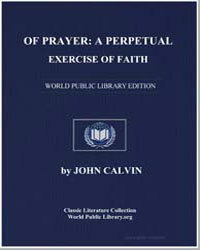 A general introduction to procure favour to our prayers never to be omitted. // 10. Objection to the third rule of prayer. Of the glorying of the saints. Answer. Confirmation of the answer. // 11. Fourth rule of prayer, ? a sure confidence of being heard animating us to prayer. The kind of confidence required, viz., a serious conviction of our misery, joined with sure hope. From these true prayer springs. How diffidence impairs prayer. In general, faith is required.